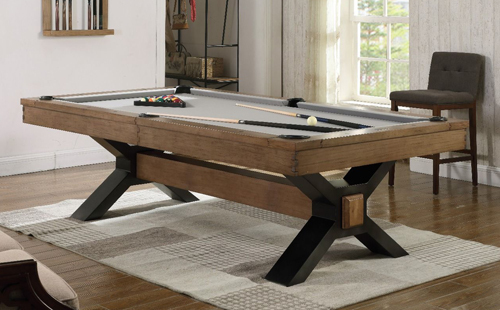 The Plank and Hide Nichols billiard table is made of solid wood and steel and finished in a Beautiful brown finish and darker legs. The table features leather internal drop pockets, metal rail sites, K66 cushion rubber for true rebound, and 1-inch backed K pattern slate for true roll. Includes double locking beams and heavy duty legs for strongest support and guaranteed stability. Overall outside dimension of the top: 100-3/4” X 56-5/8”.